I was closing part of a room in my house for use as a workshop and had to add some doors. The two ways in were both about 47" wide so I couldn't use a 48" door and I didn't want to use a smaller door. I built two doorways- one a 48-inch slider and one with two 24-inch doors. The doors themselves are plain hollow-core doors with craftsman-style trim added. The hardware is actually pocket door hardware, installed on the outside. This is the 48-inch door. It's two 24-inch doors stuck together. My plan was to stain it, but it was cold and rainy here for a few months, and now the pollen count is in the thousands (and I didn't want it to be yellow). I kinda like it the way it is, and might leave it this way. For the 48-inch door, I started with two 24-inch hollow core doors, and screwed a piece of trim to the top and bottom. I used a table saw to rip a1x4 to the width of the doors (1-5/16 inches). 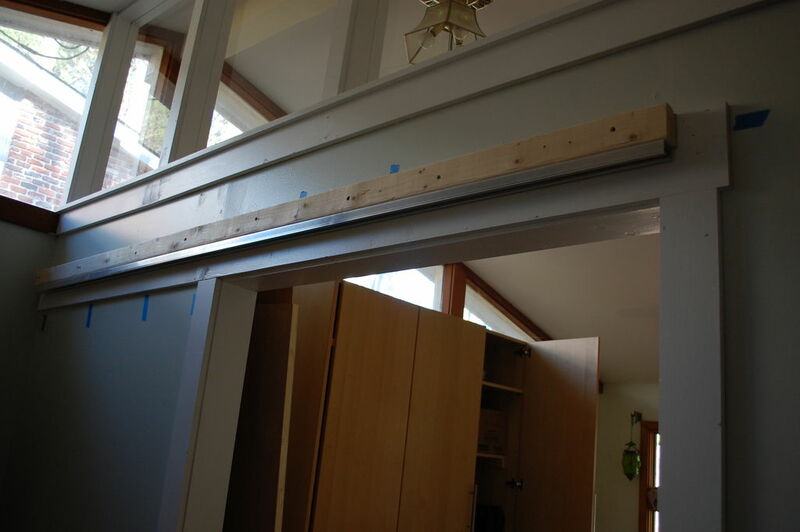 This also gives the sliding door hardware a stronger attachment point on the top of the door. For the trim, I set my table saw to the width of a 1x4 (3.5 inches) and ran a sheet of 3/16" plywood through it. Each set of doors used one 4x8 sheet of plywood and roughly two tubes of Liquid Nails. I used a nail gun to staple down the edges of the trim, and filled in above the staples with spackle. There was existing 1x6 trim over the door, which I extended all the way to the wall. Based on the height of the doorway and hardware, a piece of 2x3 lumber was the perfect size for mounting the pocket door hardware. You might have to rip a 2x4 to get the height right for different doorways. I used 3.5-inch screws to secure the 2x3 lumber through the 1x6 and the drywall all the way into the studs. The pocket door track is installed on the outside edge of the 2x3. The pocket door set I used was the 111PD set from Johnson Hardware- http://www.johnsonhardware.com/111pd.htm. I bought two sets plus extra hangers and stoppers for $100 total, including shipping. Step 5: Door Hanger Installation. The door hangers slid easily right into the track and I installed the rubber stopper on the end. I had some extra 1x6 to cover because of the existing trim, so I took some scrap 2x2s and installed this on the end so if I need to remove the doors I can remove the end cap without having an ugly screw showing on the trim. I found some cheap u-shaped plastic guides in the bypass door section at Lowes. I cut them in half and screwed them into the floor beneath and they worked perfectly. I put another half of a guide on the other end of the door to keep it from banging into the corner trim when I close it. I covered the box with 1x4 MDF trim on the front and top. It looks good, and makes a nice little display shelf too! The first door turned out so well, I decided to get fancy and put windows in the second set. The windows are made of an 18x24 sheet of clear plastic called Optix, which were $9 each at Lowes. Glass would have been a little cheaper, but I wanted the stronger plastic for when my kids inevitably slammed the doors together. I installed another piece of 1x4 at the top, cut down to 1-5/16 wide. I laid out the location of the glass and marked the door for cutting. I ended up cutting a 1/4 inch wider on the top and sides to fit the trim that holds the window in place. I cut 3/4 inch below the window for the little shelf trim. I installed the 3.5” plywood pieces on one side of the door, except for the piece that goes right under the window because I couldn’t be sure exactly how high to put it until the window was in. In order to center the glass in the door, I needed a piece of 5/8 trim on either side of it. You can buy 5/8” x 5/8" trim, but it’s about $3 each, so I just ripped some more 1x4 to 5/8” wide and used that. Apply glue to the 5/8 trim and clamp it to the 3.5” trim. I removed the protective sheeting and put a dab of silicone caulk on the corners of the plastic to keep it from sliding around, then I installed the 5/8” trim and the 3.5” trim on the other side. I spackled any imperfections and gave everything a coat of primer and two coats of paint (Behr brand, “Polar Bear”). On the second door I got smart and painted the trim *before* installing it next to the glass. The shelf trim is a piece of 1x4 with the edges slightly sanded, held in place by some spare pieces of 5/8 trim. The dentils are 3.5” wide to match the rest of the door trim. The support track went in the same as before- one piece of 1x6 trim and one piece of 2x3 lumber. The pocket door track is screwed in on the outside edge of the 2x3. Again I covered it with a piece of 1x4 MDF trim on the front and the top, painted the same color as the door. I installed two rubber stoppers in the middle to keep the doors from going too far, and one on the outside edge. These can be removed with a screwdriver if the doors ever need to come out. The bottoms of the doors are kept from swinging in or out with a little plastic guide that came with the pocket door hardware. To get the depth right I attached them to a 2x4 scrap piece and attached them on the inside of the door opening. I think these doors look great, and they’re really light weight and slide very easily on the tracks. Using the light-weight doors let me use the pocket-door set instead of something really heavy-duty, which saved a ton of money. The total project was only about $300 for both sets combined- I’d say about $135 for the 48-inch door and $165 for the ones with windows. I'm still looking for a set of handles that I like. I already owned all of the tools (except for a plywood blade for my table saw) and I had a lot of the incidental stuff like screws and staples and paint. I spent a ton of time planning this out, but if I’ve done a good job with these instructions I think a good handyman could do either project in a weekend or two. If you have any questions or if anything is unclear, feel free to ask me in the comments. Thanks! After this project was done, there was a story in the paper about how sliding doors are hot and trendy because they look good and save space. I've never been ahead of the style curve before! Nice job! Thanks for the Instructable - I need to make a door for my studio and this will work far better in the narrow hallway. I am excited to know you can use a pocket door kit to make sliding doors. Thank you! Very nice, very economical, great details. Thanks for posting! These look really nice. I might have to do this in place of the bifold doors in my laundry closet.